The Midlands Division of the Kwazulu Natal Master Builders Association has been through some exciting times, as we approach the end of 2008. 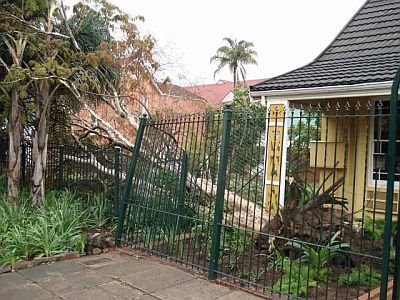 Big Storms in November brought the end to our “Big Old” Leopard tree which was uprooted, but by an act of a 'greater one', missed our building by less than a metre. Some weeks later, we are slowly getting to the “root” of the problem and we will have all things back to normal soon. The main drive over the last couple of months has been to improve or increase our range of services to Members. In the Midlands Division, we have implemented Safety Consulting. This is a paid service that assists members with their legal compliance, through the compilation of documentation and the implementation of various systems. The major benefit to the member, is that this is done at a significantly reduced rate. This enables the company to save, where they would normally make use of an outside consultant. The next step in increasing our range of services to the Members in the Midlands, will be to launch a NHBRC Courier service through the Midlands Office in Pietermaritzburg. The project, which will be launched early next year, will enable Members to submit their NHBRC paperwork through our office and then we will courier this to Westville who will submit this to the NHBRC office in Durban. Members will therfore no longer need to travel to Durban to submit paperwork for houses they are building. We anticipate that this is going to be a great success and will go a long way towards increasing membership in this region. As stated earlier our main drive is to improve or increase services to our Members. Therefore, if you have any suggestions that will help us achieve this objective, we ask you to contact us. For any other queries or questions, please feel free to contact me anytime.